Joyce Williams-Vickers had worked at the First National Bank on Baltimore Street for nine years when the opportunity arose for a job in the courthouse on Washington Street. “As a teller, I used to wait on the judges, and one day Judge (James) Getty asked me how I would like to work at the courthouse,” said Williams-Vickers, who this month will end a 30-year public service career that began Aug. 3, 1981. 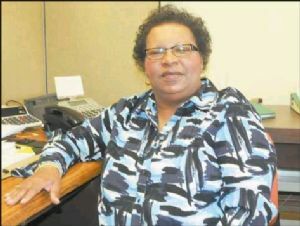 She worked for Ray Walker, clerk of the court, for the next eight years as an assignment clerk. In 1989, Joyce became a county employee, taking the jury commissioner job in addition to her duties as assignment clerk, working for Judges Getty, J. Frederick Sharer and Gary G. Leasure. “I learned how to schedule cases under Judge Getty. With Judge Sharer, I learned about jury work, and from Judge Leasure I learned different ways with scheduling of criminal and civil cases and working with jurors. I liked working for all three judges,” said the Cumberland native and Allegany High School graduate who attended Catherman’s Business School for a half-year. She interrupted her schooling to take the job at the downtown bank where she worked in the mailroom and later as a teller. For the last 22 years, Joyce has served as the county’s jury commissioner. “Jurors now serve for one month, and I send summonses out, conduct orientation programs for the jurors who were addressed by the judges and leave messages every night on the phone for the jurors to call to see what time they should report to the courthouse for jury duty,” said Williams-Vickers, who said she won’t miss getting up early for work or stepping outside on those blustery cold days when duty called. “But what I will miss the most about this job is the people. I meet 80 new people very month. I’ll miss that the most. “This is rewarding work but it has its drawbacks. Not everybody wants to be a juror so you have to deal with that. But there have been people that I have worked with in the last 30 years who helped me get this far. Eleanor Albright — she was a clerk in Ray’s office who helped me get started,” said Williams-Vickers, who seems to have a smile for everyone she meets. “My mother (the late Phyllis Virginia Williams, who died in 1994) always said it takes less muscles to smile than it does to frown,” she said. In her retirement, Joyce and husband Warren Vickers plan to visit relatives in various parts of the country, including their daughter Marsha Williams Vickers who resides in Atlanta. Joyce said she also intends to increase her activity as a member of the McKendree United Methodist Church in Potomac Park.